Which Parts of AV Won’t Be Consumed By IT? 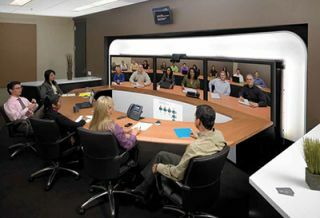 Room-based conferencing systems like those that Cisco offers are often being overlooked in favor of desktop or mobile solutions.Let’s all hail Pac-Man, and how that classic video game’s pizza-shaped hero was manipulated through a maze, gobbling up dots as fast as he—or you—could manage. Some ask if AV is going to be gobbled up by IT in a similar manner, relegated to a mere niche that is relied upon for fine-tuning the end-points of a communications system. Are we in a no-man’s land where IT won’t be able to master AV’s unique idiosyncrasies, or is there a definite line of AV/IT demarcation? This casts AV’s value as personalitydriven and based on immediate service, good or bad. Because it hasn’t had a functional organizational home, has not been well managed, nor had proper investment or oversight in the corporate world, such as IT has had, AV hasn’t really flourished or become as integral. But that doesn’t mean it hasn’t delivered high value, he argued. “If AV is going to grow and flourish with greater investment and relevance to any business, we have to bring it into mainstream management and give it the opportunity to be managed by a part of an organization with form, function, and proper standards, recognized as a fundamental part of business, not an unmanaged sideshow,” Phillips said. “The answer is that only one function within an organization deserves to have AV responsibility, and that is IT. When Paul Depperschmidt, global AV integration market development manager for Cisco Systems, attended the recent Enterprise Connect show in Orlando, FL, he noted a repositioning representing the move to unified communications and enterprise video. Most of the major network/telephony players were there, with keynotes from Cisco, Microsoft, and Avaya. Think of video in enterprise as a pyramid, he suggested, with those room-based systems at the top and affordable, scalable video at the broad base. The whole pyramid will get larger in the years to come as large enterprises deploy more desktop, mobile, and BY OD right along with the rooms. Growth will continue in the bigger, custom rooms, but the less expensive rooms and the enterprise-wide deployments will grow much faster. There’s no doubt that as the industry continues to evolve, lines will blur and AV integrators will need to adapt. Are there any remaining facets of AV that remain too esoteric for IT to contend with? InfoComm’s Certification Committee periodically looks at potential certification programs its members might be interested in creating based on the needs of the industry, job requirements, and access to a supporting body of knowledge. In the meantime, InfoComm University has developed some new networking classes including Networking Technology, a new primer which will be offered for the first time at InfoComm 2013, and Networked AV Systems, an intermediate to advanced three-day course that debuted at last year’s show to strong reviews. “We developed this class because our subject matter experts determined that in today’s industry one needs a CTS-level understanding of AV technologies and design principles, and quite a bit of the CompTIA Network+ level understanding of networking technologies and design principles,” Taggart said. Maybe you’re wavering about which certifications and standards to add to your bag of tricks. Beyond those that are AV-related, certain IT certifications are out there, too, with the horizon looming closer and closer. Will you need these to attract and qualify for desired projects in the future? Certifications also will ensure that the industry remains educated on the IT component and the solutions being implemented. “Standards will certainly play a key role, especially when dealing with network security, emergency paging systems, or other critical environments where our solutions are required to deliver vital messaging,” said AVI-SPL’s Mark Linton. Groups such as InfoComm and AQAV are developing those base-level best practices and standards. They are developed from input by integrators, consultants, end-users, and manufacturers globally. Rapid adoption of the best practices would allow every facet of the industry to establish what quality in the AV industry means. Without them the AV Industry could easily lose control of the definition of AV quality and the market could follow.